Inventory We are a resale marketplace, not a box office or venue. Ticket prices may exceed face value. This site is not owned by Citi Field . Citi Field is the home of the mighty New York Mets. Located in Flushing Meadows-Corona Park in the borough of Queens, Ny. The 7 Train subway makes a stop here so transportation is never as problem. Opened in March of 2009 the new home of the Mets was a 850 million dollar undertaking by the city of New York. Being a MLB stadium you might think that they only have baseball games there, But they have hosted sold out concerts by Billy Joel, Dave Matthews Band, Sir Paul McCartney, and Zac Brown Band. Citi Field has been fortunate to host Soccer matches and Lacrosse games as well. Capacity for Citi Field is 45,000 plus for concerts. 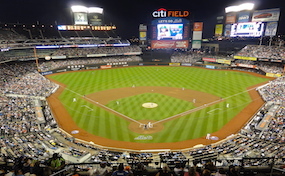 Citi.FieldFlushing.com is not affiliated with any primary box office or supplier. We are a privately owned and operated business specializing in sales in the secondary market. To buy tickets for any Citi Field events in Flushing Meadows simply click on the event of interest or call our operators at anytime.